Of the many incredible moments in the Chicago Cubs World Championship 2016 season, two stand out: Dexter Fowler‘s surprise entrance in Mesa, Arizona on the first day of full-squad Spring Training last year, and Kyle Schwarber‘s remarkable appearance on the World Series roster after a season on the Disabled List. Many fans had written off both players. Yet there they were, one surfacing just in time to join the Spring roster, the other recovering just in time to play a pivotal role in the World Series triumph. Dexter Fowler was the Cubs center fielder during the 2015 and 2016 seasons. In December 2016 he stunned the Cubs faithful by signing a five-year contract with the rival St. Louis Cardinals. There is a poignancy to Fowler’s departure from Chicago. Looking back, his surprise appearance in the Cubs 2016 camp proved to be a good omen for the Cubs. After a solid 2015 campaign, the veteran turned down the Cubs “qualifying offer” of one year and $15 million to test the waters of free agency. The Cubs front office was quiet on the subject and as the team prepared for spring training there was speculation that the team would move prize free agent acquisition Jason Heyward from right to center field, promote Albert Almora Jr., or make a move for one of the several other outfielders then available on the free agent market. Javier Baez, who during 2016 would emerge as an elite multi-position infielder, even began working out in center field while playing winter ball, as if the team was bracing for the loss of Fowler. Then the news broke, with Spring Training already underway, that Fowler was going to the Baltimore Orioles with a three-year contract in hand. It appeared the O’s landed themselves a capable lead-off man and a fine teammate. Then came the Arizona Surprise (not to be confused with Surprise, Arizona): Photographs showed “Dex” walking on the training complex field, wearing jeans and a plain white tee-shirt, a mob of blue-clad Cubs surrounding him. 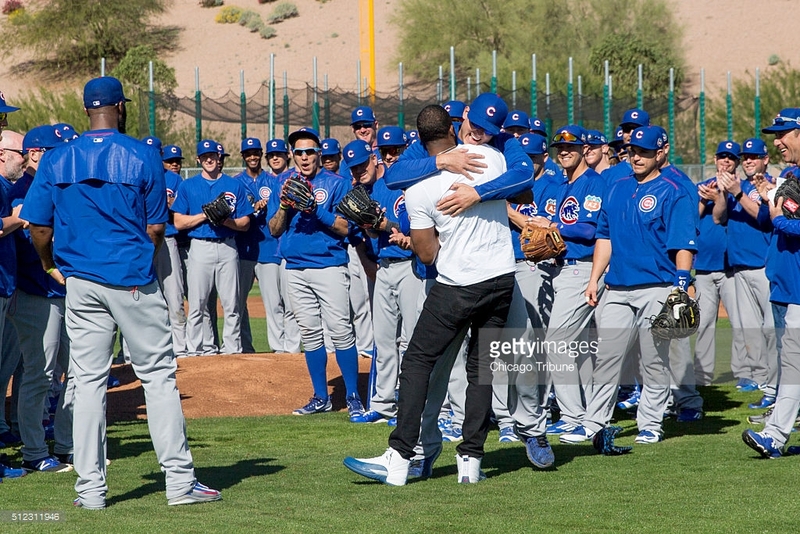 Fowler and Cubs President Theo Epstein appeared to share a heartfelt embrace. What was going on? Fowler’s agent Casey Close explained to the press that the Baltimore deal was reported prematurely; that his client had never agreed to sign with the Orioles; and that he did in fact sign a two-year, $8 to $9 million per year deal to return to Chicago. Already popular, the ever-smiling, tall, slender lead-off man soared in 2016, getting off to a red-hot start at the plate and showing a renewed confidence in center field. Cubs coaches played Fowler at greater depth in center in 2016; his defense dispelled the notion that he had inferior range compared to his center-field peers. Cubs fans embraced the motto “You go, we go,” which referred to the Cubs propensity to win when Fowler, a patient hitter, managed to get on base. Unknown to him or anyone else, Fowler would play a role in setting up the Cubs post-season shocker. On April 7, 2016 at Chase Field, the Arizona Diamondbacks’ Jean Segura struck a drive to the left-center field gap. Schwarber and Fowler converged on the ball; when Schwarber failed to yield, the two collided running near full speed. As Segura circled the bases for an inside-the-park home run, Schwarber writhed in pain on the warning track. Days later an MRI revealed a catastrophic injury to the left knee: A torn anterior cruciate ligament (ACL) and lateral collateral ligament (LCL). Team doctors announced the grim news. Kyle Schwarber‘s season was over before it had really begun. He had no hits and one walk in five plate appearances, which would be his tally for the entire 2016 regular season. Faith is a powerful resource, and the men on both ends of that awful April collision are driven by it. The day Schwarber received his diagnosis he wrote “This is a test of character and plan to attack it head on.” Schwarber’s former minor league roommate and current Seattle Mariner, Dan Vogelbach, commented that Schwarber’s initial concern following the injury was for Fowler – was he going to be ok? Fowler was more than ok. He batted .276 with a .393 on base percentage for the season and chipped in with 13 home runs. In late August, during a game against the Los Angeles Dodgers, soon-to-retire broadcasting legend Vin Scully cited journeyman Fowler’s faith and upbringing to trust that success will come “in God’s time.” In characteristic style, Scully went deeper than the media guide, noting Dexter’s off-field generosity in “paying away the lay-away” for some pleasantly shocked back-to-school shoppers. Scully also regaled viewers with an anecdote about Fowler’s impressive collection of sneakers, numbering about 300 pair. It is a shame Schwarber was still off the active roster for Scully’s commentaries, which themselves were a memorable roll-call of Cubs achievements and anecdotes. Initially, several commentators criticized the Cubs for exposing Schwarber to excessive risk by playing him in the outfield, the implication that his career was jeopardized by the move. A player of Schwarber’s character would have none of such playing the victim. Scully would have noted that, and he would have praised the young man’s work ethic, “crushing the rehab,” as skipper Joe Maddon correctly predicted he would. The Cubs plan for Schwarber was not too far removed from the way that Hall of Fame catcher the late Gary Carter started his career. Like Schwarber, “The Kid” played a number of games in the outfield in his early seasons, with Barry Foote in the regular catching role. The Cubs carried two savvy veteran catchers on their active roster, David Ross and Miguel Montero. As the Cubs won ballgames at an unprecedented rate through April-May, the team rebuilt its confidence in its ability to win despite the loss of its slugging 2015 phenom, and criticism of the Cubs “risky” deployment of Schwarber faded to the background. When Montero went on the Disabled List with a thumb injury, 2015 AA Southern League batting champion Willson Contreras seized the opportunity and was soon the new guy shuttling between left field and the catcher’s box. The Cubs marched into postseason with the wind at their backs, clinching early enough to enable Maddon to experiment a bit with the expanded September roster while getting his team ready for the playoffs. As is so often the case with teams that win more than 100 games, tough postseason roster decisions loomed, a bit like trying to fit 30 pounds of talent in a 25-pound sack. Faced with all those tough roster decisions – the ones that left starter Jason Hammel, veteran reliever Joe Smith, infielder Tommy La Stella, and outfielder Matt Szczur off the World Series roster – the Cubs front office showed remarkable faith in Kyle Schwarber. The club announced that the lefty swinging slugger would join the team for the World Series. Scouts watched him play in the Arizona Fall League and prepared him in batting practice with a crash course of pitches, as if to offer him in just a few days a season’s worth of the fastballs and change-ups that he had missed during his recovery. Incredibly, the catcher turned outfielder was not cleared to play the field – he would only play as a designated hitter for the four games in Cleveland and be available to pinch hit in Chicago, nothing more. So, how did that “nothing more” work out for the Cubs? Schwarber came back like a secret weapon and batted .412 (7-for-17; 3 walks) in a Series not known for offense. These events were almost poetic. You go, we go. He falls, he crushes rehab. The Cubs historic, drought-ending triumph was a World Series for the ages. The Cubs and the Cleveland Indians alike displayed the finest traditions of competitiveness and sportsmanship. Kyle Schwarber anticipates a full return to health in 2017. He is getting work behind the plate about two days a week in Spring Training. Contreras and Montero will be the regular catchers, with Schwarber most often playing left field. Joe Maddon has already batted Schwarber leadoff in the 2017 spring games, a move that links him to Fowler in yet another way. Dexter Fowler declined his mutual option and the Cubs $17 million “qualifying offer” and is smiling these days out from under a bright red brim. One thing is certain: a grateful and gracious crowd will roar its approval when he returns to Wrigley Field in 2017, no matter whose uniform he wears.